The substances that have ability to dissolve other materials are known as solvent. It can be liquid, gas or solid. Water has excellent solvent properties. It can dissolve a vast amount of substances. Therefore it is called universal solvent. The polar effect (dipole moment) and high dielectric constant properties make the water excellent solvent. It plays an important rule to the entire living thing on the earth. Whenever the water goes to our body, it takes valuable chemicals, minerals and nutrients. This polar property of the water can form electrostatic interactions with other polar molecules and ions. Therefore water can interacts with different charged and polar substances but does not react with nonpolar substances like oils. The positive ions or partially positive charged molecule of a substance feel attraction with the partially negative charged oxygen atom. On the other hand the negative ions or partially negative charged atom of a substance feel attraction with the partially positive charged hydrogen atoms. This is called ion-dipole or dipole-dipole force of attraction. This force of attraction between the water molecules and ions or partially charged molecules is lead to the formation of a three-dimensional hydrated ions, or hydration shell which is lower in energy compare to separated ions or molecules. These hydration shells allow particles to spread out evenly in water. The partially charged water molecule does not remain fixed with a single ions or a molecule which is changed with time to time. So the average number of close water molecules with an ion is called hydration number of that ion. Normally the hydration number of a cation is larger than an anion. 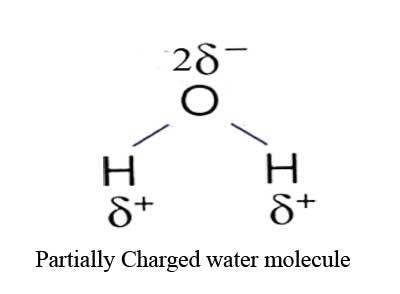 On the other hand small and highly charged ions have larger hydration number. For an example we can consider the compound sodium chloride (NaCl), which is an ionic compound. 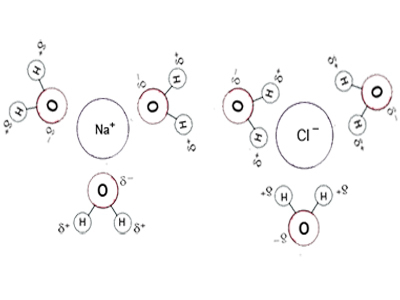 The partially positive charged hydrogen of the water molecules attract to the negative Cl– ion, whereas the partially negative charged oxygen of the water molecules attract to the positive Na+ ion. This force of attraction between dipolar water molecules and sodium chloride ions causes the formation of hydrated ions. As a result the sodium chloride will dissolve with dissociation process and forms a homogeneous solution. Brackish water is a homogeneous solution of sodium chloride. Same way many bio-molecules are either polar or charged. Nonpolar molecules, like fats, lipids and oils, don’t interact with water at any considerable level because they have zero dipole moment (no partially charged atoms). They have weak electrostatically force of attraction to water molecules. This weak force of attraction would not overcome the strong force of attraction between polar water molecules. Therefore they stay in two separated layers and known as hydrophobic. Normally they are organic compounds. They are dissolved in some non polar substances like benzene, carbon tetrachloride.